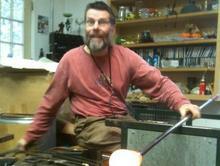 We are husband and wife glassblowers, Andy Pyle and Leslie French. Over the years following our meeting in a glass studio in Kent, CT in 1986, we found ourselves making more and more pieces that combined our separate interests in glass (color for Leslie, silhouette for Andy) so we founded Nunwell Glass in 1990 as a means of focusing this fusion of ideas (still a work in progress). Married in 1992, we bought our home in Lime Rock, CT in 1996. Our studio was completed in 2003. Over the years we have worked with many great people, we would like to thank them all for their generosity with their studios and their expertise.